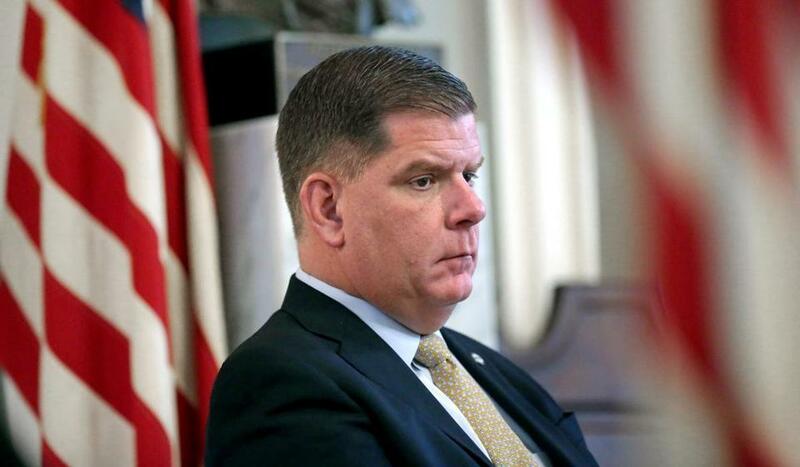 Mayor Martin J. Walsh plans to roll out a set of transportation initiatives Thursday, including proposals to lower speed limits in neighborhoods to 20 miles per hour and create designated pickup and drop-off sites in certain areas for ride-hailing services such as Uber and Lyft. At his annual speech for the Boston Municipal Research Bureau, Walsh also is slated to announce that he has appointed a transit team to collaborate with the MBTA on issues such as quickening the bus system. And, he’ll say the city will offer free MBTA passes to all middle and high school students, regardless of the distance to their schools — an increase from roughly 20,000 to more than 30,000 passes, at a cost of several million dollars. The speed limit plan follows a recent City Council proposal to limit the speed on neighborhood streets from 25 to 20 miles per hour, after the city had already reduced that number from 30 miles per hour two years ago. Osgood said the proposal would need state approval and the city must still work with city councilors and the state Legislature to identify where the speed limit should be lowered. The goal is to target neighborhood roads, not main throughways, he said. “We know that lower speeds save lives,” he said. Amid concerns that Boston police have low rates of enforcing speed limits, Osgood said a lower speed limit will serve as a deterrent. He cited a Boston study by the Insurance Institute for Highway Safety that showed the city saw a 29 percent reduction in the number of cars traveling faster than 35 miles per hour after the speed limit was last lowered. With funding from last year’s parking fine increase, the city has created a transit team to communicate with the MBTA, specifically on plans to speed up the regional bus transportation system. More than 350,000 passengers ride buses on every weekday, according to 2017 data, and buses remain the MBTA’s least reliable form of transportation, Osgood said. The plan would build off of a rapid bus transit pilot program in Roslindale, and would create a similar system — with designated bus lanes — on Brighton Avenue in Allston, and from the North Washington Bridge to the Haymarket bus system. Osgood said those target routes “are areas where we have a high number of bus drivers going at very slow speeds,” though the program could be eventually extended to other areas. He said the city will next target the Blue Hill Avenue corridor after hosting neighborhood meetings to discuss that route, which is longer and involves more business districts. Walsh’s plan also looks at the increase use of ride-hailing programs such as Uber and Lyft, which studies show has made traffic worse in Boston. Osgood said the city will focus on the effects of ride-hailing services such as double parking. In the next month or so, the administration will create its first designated curb space for ride-hailing pickups and drop-offs via a pilot program at Boylston and Kilmarnock streets in the Fenway neighborhood. Riders in a two-block vicinity of the dining and night life hub will be directed to the rendezvous spot in the companies’ apps — much like the current designated pickup spots at the airport. The spot will not yet be used for events letting out at Fenway Park, however. “This is one of the places [the companies] identified as being a challenge both for drivers and riders. It was also something we were hearing from local businesses there, so it made for an interesting place to try this,” said Kris Carter, who leads the Mayor’s Office of New Urban Mechanics. The city is converting four parking spots to create the designated area, which will be active between 5 p.m. and 8 a.m. The city’s transportation department will install signs to guide riders and drivers to the spot, and, they said, it can be used by other drivers picking up or dropping off passengers — not just ride-hailing trips. The city will observe how it works in the Fenway before potentially expanding to other parts of Boston, Carter said. Uber and Lyft representatives said they support the Boston project. “These zones will not only make moving around the area more convenient and frictionless, but it can meaningfully reduce congestion and improve the experience for drivers, riders, and the greater Boston community,” said Campbell Matthews, a Lyft spokeswoman. Gina Fiandaca, the city’s transportation commissioner, said that the mayor’s announcement builds on an action plan the city has slowly been implementing, though she said the city also needs help from the state. The city has in recent months lobbied state lawmakers to allow Greater Boston communities to levy taxes to fund transportation projects; to assess higher fees for Uber and Lyft trips, especially for those with only one passenger; and to use cameras to enforce some driving violations, such as failure to stop for a school bus.